Get ready for an adventure that encompasses the Grand Canyon's astounding natural beauty and also the historical significance of the area. 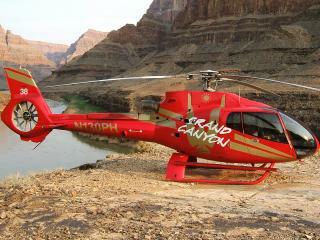 Your tour starts with a hotel pick-up and a transfer to Boulder Airport where you'll board a helicopter for a flight to the Grand Canyon's West Rim. On the way, enjoy views of the southwest desert, Hoover Dam and Lake Mead before enjoying the sort of Grand Canyon vistas that only an an aerial perspective can provide. Upon arriving at Grand Canyon West, you will descend 4000 feet to the canyon floor, land by the Colorado River and enjoy a champagne picnic meal. After you marvel at the natural wonder of the Grand Canyon, you will travel on to Eldorado Canyon and disembark for a fully guided tour. Miners from near and far descended on this area during Nevada's biggest mining boom, and you will learn more about their life, work and history during a guided tour of the Techatticup Gold Mine and Mill. In addition to learning about the site's historical significance, jump on a Baja Jeep or ATV (see below) for a 2-hour guided tour of the beautiful desert nearby. Enjoy a boxed lunch and champagne toast in Eldorado Canyon before heading back to Las Vegas. This tour is only available from Las Vegas. Flights depart from Boulder City Airport. Transfers to and from the airport can take up to 90 minutes. Helicopters are very sensitive to weight and weight distribution. As such anyone weighing over 300lbs (21.4 stone/136 kilos) will be charged for an additional tour seat locally and a $200 supplement will be payable upon check-in. All passengers must be weighed at check-in. All weights submitted must be accurate or you may be refused boarding if weights are incorrect. Fuel surcharges may apply. Please see tour description for details. Total flight time is around 70 minutes in total. Is there a weight limit for an individual passenger? Layered clothing is recommended through the months of March to September, and winter clothing should be worn from October to mid-March. The ground at the Grand Canyon is rough, rocky and uneven, thus it is important to wear sturdy, toe-covering shoes that can handle rough terrain. Sneakers or hiking boots are highly recommended. Don’t forget your camera! Cameras and phones are allowed and encouraged but please be aware that the use of "Selfie Sticks" and extending camera poles is strictly prohibited in and around the aircraft. Finally, all passengers booked on this tour must have government issued forms of identification.